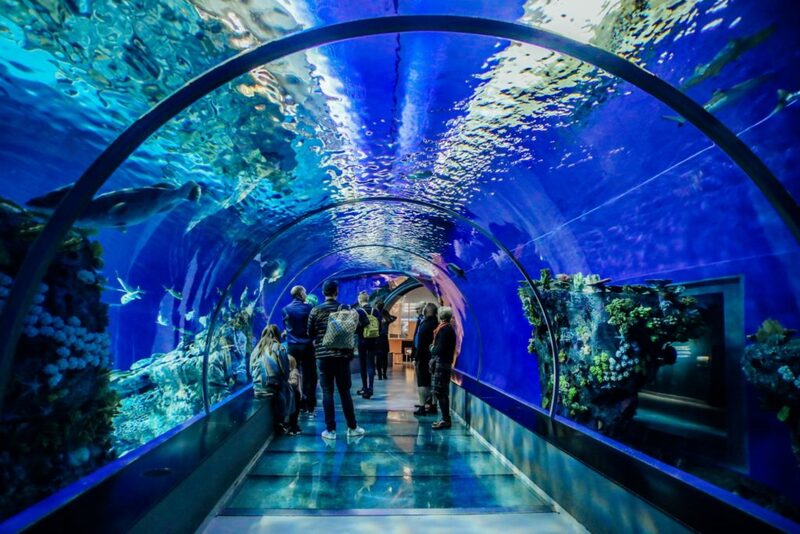 Ripley’s Aquarium of Canada is Toronto’s newest large attraction – it’s about five years old now – and it has quickly become one of the most popular. And why not? Over 15,000 aquatic animals (the octopus is our favourite! ), a moving walkway through a 315-foot viewing tunnel, several play structures, and educational dive presentations guarantee a great visit for all! Bringing kids? The fun starts right in the foyer with aquatic-themed play structures ready for kids to touch and climb. When you force the kids to move on, you’ll follow the exhibits through the 35,000 square foot building over the course of two to three hours. There’s a resting area halfway through that has tables and chairs, a cafe, and climbable play equipment for the kids to enjoy. Ripley’s exhibits are captivating, especially the walk-through tank filled with fish and sharks, the floor-to-ceiling coral reef tanks, and the inventive jellyfish displays – and in early 2019, the seahorses had babies! Combining Ripley’s with the CN Tower (they are right next to one another) makes for a full, but manageable and fun, day. Here’s everything you need to know to have a great Ripley’s visit, including hours, prices, tips, how to to get there, parking, and nearby hotels. Whereabouts is Ripleys? 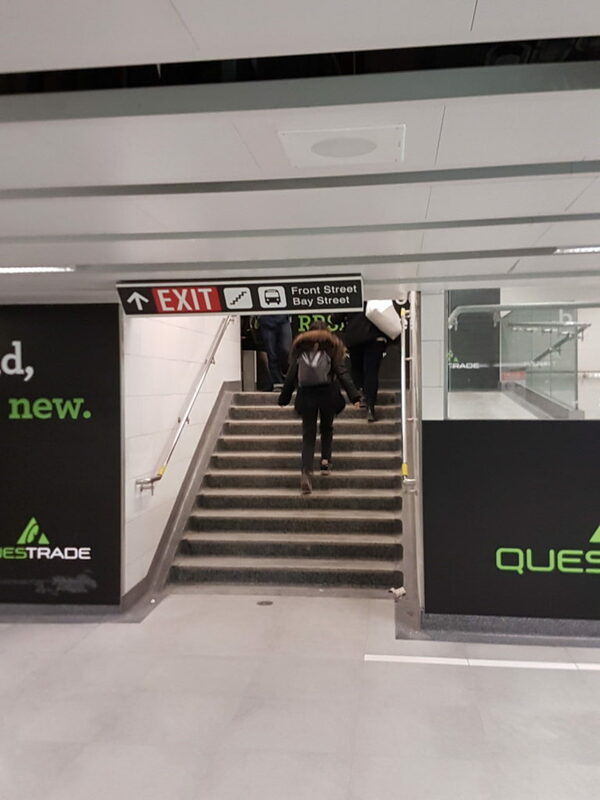 Central-south downtown Toronto, a 10 minute walk to the Harbourfront, right next to the CN Tower, and a 10 minute walk from Union subway station. Got time? Sign up for Ripley’s email newsletter or follow Ripley’s on Twitter: If you’re organized enough to be planning ahead (what’s that like, anyway?) Ripley’s offers occasional deals on admission through its email newsletter and Twitter feed. Seeing a few attractions? 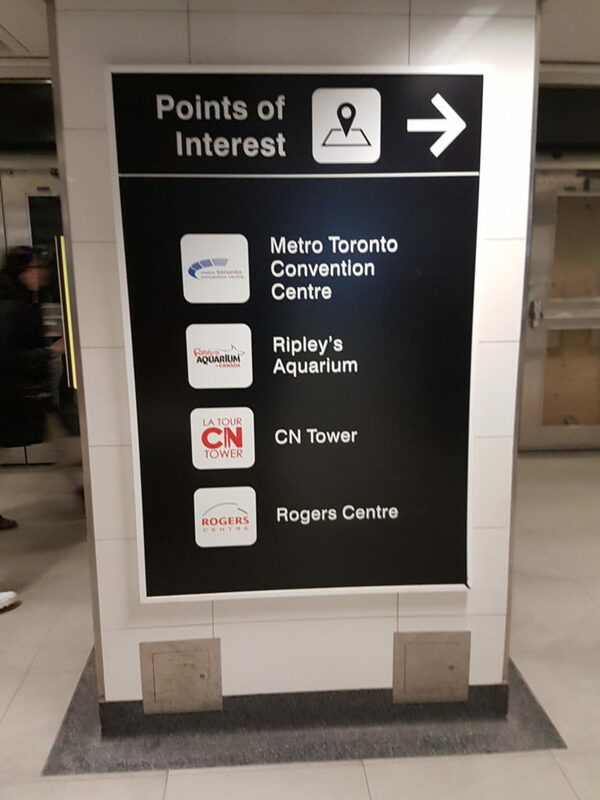 CityPASS: Toronto has a CityPASS that provides a deal on admission for Ripley’s, the CN Tower, the Royal Ontario Museum, Casa Loma and the Toronto Zoo or the Ontario Science Centre. If you plan to see at least three of these attractions within a period of 9 days, the CityPASS is almost definitely your cheapest option. Our recommendation: Combined ticket with CN Tower: If you won’t get value from the CityPASS, we strongly recommend the Sea to Sky Combo ticket, which provides for admission to both Ripley’s and the CN Tower for the same price as the CN Tower normally costs alone. The Sea to Sky ticket is is a great value, especially for kids and seniors. Don’t forget Groupon. There’s often a Groupon deal for Ripley’s of at least a few dollars off the regular ticket price. Book ahead. Line-ups to purchase tickets on-site can go around the block, so booking ahead is strongly recommended! Allow at least two hours to visit. Tickets do not allow for in-and out-privileges. Go before 11 am or after 3 pm. If you have kids with you, the best time to go is right at 9:00 am (unless you have a stroller and are taking the subway, in which case aim for closer to 10:00 am. Stroller + the subway at rush hour = unhappiness for everyone). Ripley’s doesn’t get crowded until 10:30 to 11 am so you’ll get good exhibit and dive presentation access, and the play structures won’t (yet) be run amok with children running headlong into one another. Without kids, I love to go in the evening. The “Sharks After Dark” 7 pm ticket is $7 less than the normal ticket price. Going in the evening will afford you a complete lack of crowds and a more captivating experience, undiluted by nearby screams of “Mom! That fish is POOPING!” For a full, amazing evening, follow your aquarium visit with supper in the 360 Restaurant at the top of the CN tower just next door – the ride up the tower is free with a purchase from the prix fixe menu ($65 pp) by each guest. Load up the stroller: Ripley’s is stroller and mobility-device friendly, has family washrooms with change tables, and has a dedicated area for nursing. There is a cafe and playspace strategically placed mid-way through the exhibits, and you can bring your own food and drinks. Unless it’s a holiday: If you visit Ripley’s on a statutory holiday, it will be very crowded. On those days, and on P.D. days when Ontario public schools are closed, we suggest you leave the stroller at home (or check it at the coat check for $2) and try to visit before 11 am or after 4 pm. Tip for the manta ray show: The dive show at the ray tank is worth taking in if the timing is convenient, not only because it’s informative and keeps the kids sitting down for a few minutes, but also because during the show, the serene floor to ceiling jellyfish exhibit just next to it will likely be almost empty. Wait for the dive show to get into full swing, sneak over to the huge blacklit tank of floating jellies, and feel the zen. A DSLR camera is best. Ripley’s lighting is dim throughout and the photography subjects are in constant motion. You’ll need to crank the ISO, leave the flash at home, use burst mode and steady yourself against walls and guard rails to get good photos. Smartphone photos are typically disappointing. Want to skip the gift shop? Ripley’s has a high-quality gift shop, but if you’re like us and avoid gift shops when our kids are with us, try this: when you reach the last large open-air touch tank, which will be on the left, try to keep your kids focused on touching the rays in the tank until you can walk the full length of the tank. By that point you’ll have passed most of the shop (which will be on your right). 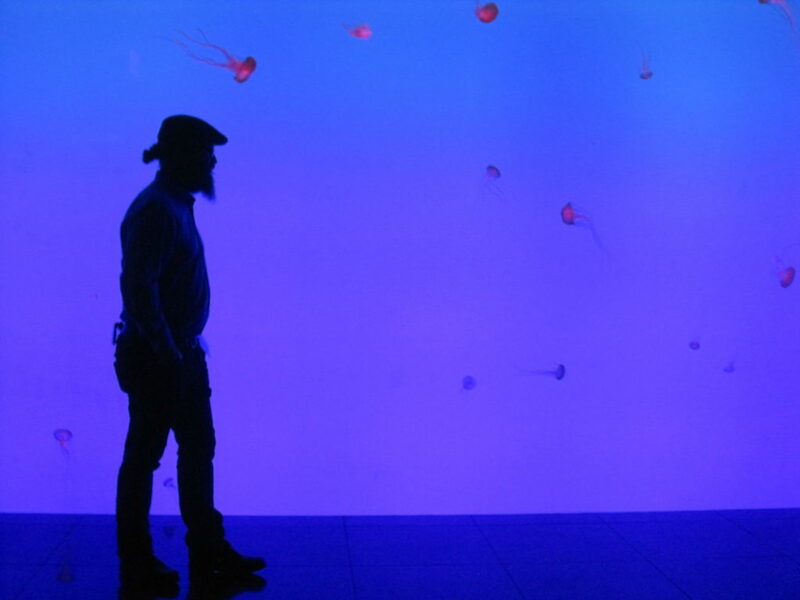 Bonus Ripley’s experience: Aquarist for a Day: If your teen (14 years+) is an aspiring Jacques Cousteau (and/or you’d like some time apart), you can sign him or her up for “Aquarist for a Day”, held Saturday mornings. Experiences vary but generally include a full behind-the-scenes tour and helping to feed the animals and maintain their habitats. Aquarist for a Day tends to fill up early, so click here to see current pricing and to reserve a spot. If your accommodation is downtown you can likely walk to Ripleys – it’s at the bottom of the CN Tower, so just look up and aim for that! 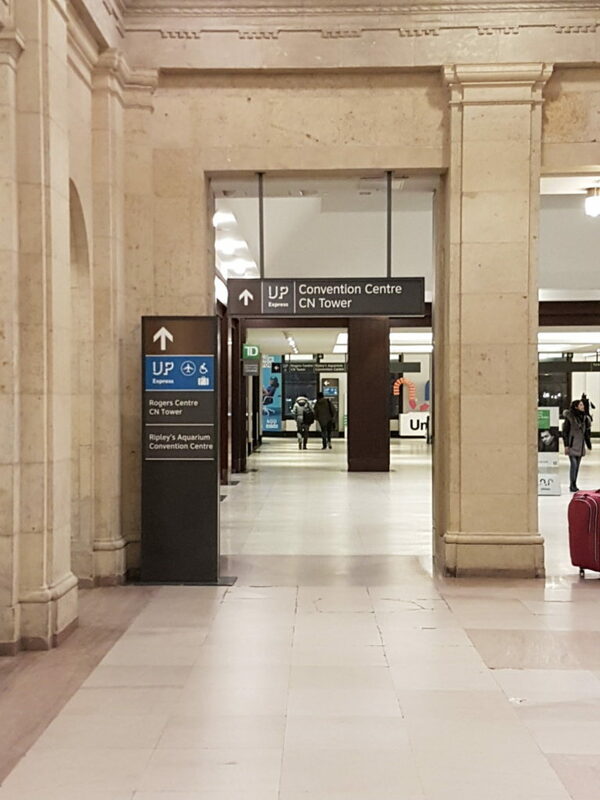 The closest subway station is Union Station. It’s about a 10 minute walk to Ripley’s and you can walk one of two ways: either through the enclosed overpass (called the Skywalk), or outside. If you have a stroller or mobility device, we recommend walking outside, because the elevators in the Skywalk are not reliable. Exit the turnstile, turn right, and keep walking until you find this stairwell, which has a ramp to the right of it. Go up the stairs or ramp to the next level up. When you get to the top, head to the right to find the long wide corridor that continues in that direction (west). 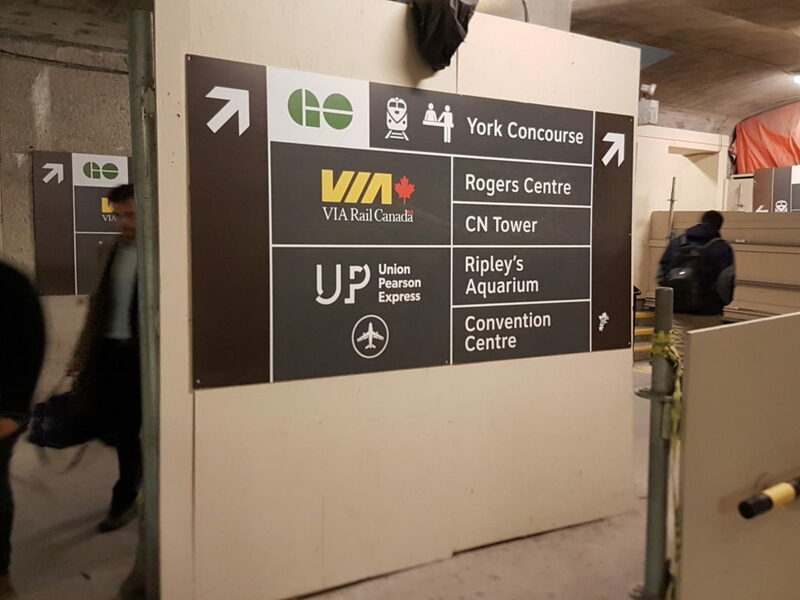 Follow the signs up into old Union Station and keep walking in that direction, following the signs to either the CN Tower or Ripley’s Aquarium (they are in the same place). The corridor will eventually angle left and take you across a glass-enclosed bridge to the CN Tower and Ripley’s. Ripley’s Toronto does not have its own parking lot. There are several underground lots nearby, all of which charge a fee. The closest parking lot is at the Metro Toronto Convention Centre South Building (222 Bremner Blvd, Ripley’s Aquarium is 288 Bremner Blvd). At the time of writing this lot cost $12. If your Toronto visit is focused on Ripley’s Aquarium, the CN Tower, and/or an event at the Roger’s Centre, the Toronto Mariott City Centre Hotel is your best bet – it’s the closest hotel to Ripley’s, is moderately priced for downtown Toronto, and has a pool, hot tub and it’s own decent restaurant (a real plus, as good restaurants are few and far between in this area). Again in this area, and a real treat, is the Toronto Radisson Admiral Hotel. In summer, the rooftop pool is a great place to be, and the hotel’s Watermark Restaurant is a going concern in its own right – as in, people who are not hotel guests make a point of eating there. If you’ll be zipping around Toronto on the subway, the Fairmont Royal York is a Toronto institution. It’s perfectly situated right across from Union Station and the shuttle stop for Billy Bishop Airport, has an indoor pool and the restaurant’s chefs grow herbs on the roof. Want to get out of the financial district and into some downtown Toronto neighbourhoods, and save some money? The Toronto Super 8 by Wyndham Downtown is right in Chinatown, walking distance from Kensington Market and independent boutique-filled Queen Street West. TTC accessible subway map shows all of the Toronto subway stations and shows which ones have elevators. This Toronto map includes a subway map, a close-up of the downtown area, and a full index. Can you tell I love the jellies? Please pin me! Looking for more things to do in Toronto? 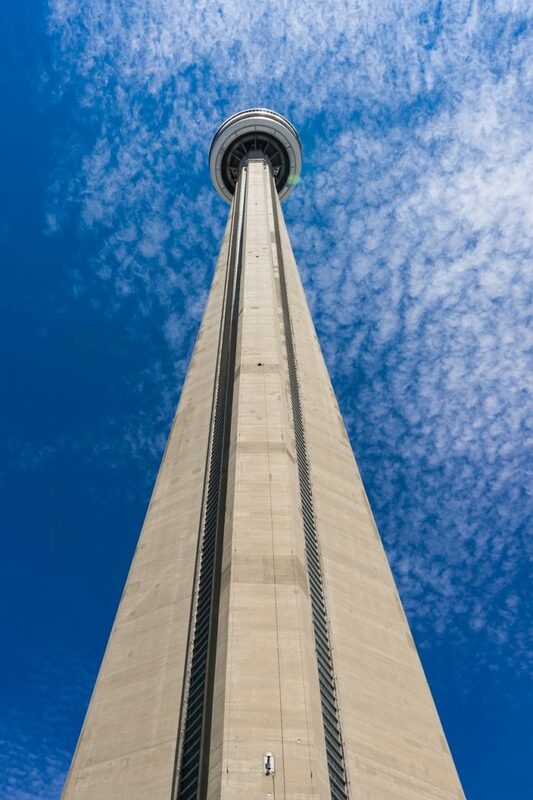 Read our tips for visiting the CN Tower, right next door to Ripley’s!